The Tree: Guided Imagery for Manifesting Prosperity is hypnotherapy designed to instruct the unconscious mind to manifest prosperity. It is based on the law of attraction and the spiritual principle that your life is a mirror reflection of what you think about all day long. The imagery used is delivered in the remarkably soothing voice of Dr. Loretta Siani. Yoga nidra is a great practice that helps with sleep meditation. 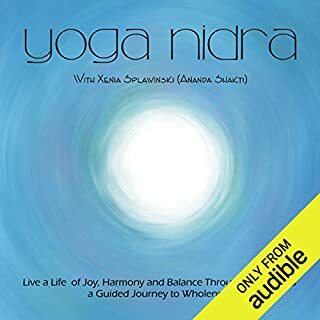 Through this audiobook, you can learn valuable information about how to utilize sleep meditation and how yoga nidra plays a part in this. Through this, you’ll be able to live a more fruitful life and understand what stress and lack of sleep does to the body, and to the spirit. 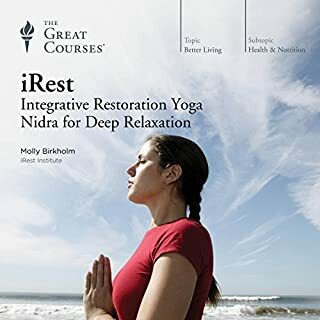 You’ll be able to actually use yoga nidra, along with sleep meditation, in order to bring yourself to the relaxed state of mind that you know you want to have. The 61 Points of Light: Yoga Nidra is a meditation exercise. Yoga Nidra is a sleep-like state that Yogis have reported to experience while meditating. It is said to be one of the deepest possible states of relaxation one can achieve while still maintaining full consciousness. This meditation is highly effective for reducing tension and anxiety, balancing the autonomic nervous system, and for undoing various tension and anxiety-related symptoms such as poor concentration, chest and abdominal pain, palpitations of the heart, and sleep and memory disturbances. It has also been used to help soldiers cope with post-traumatic stress disorder. I really like this short and effective guided meditation. It is a bit different from other body scan type of programs I have experienced. It only lasts about 25 minutes and is perfect for daily practice. However, don't expect to use it as a sleep program. I find that it really focuses my mind and helps with concentration--but I feel alert and don't fall asleep while listening. Further, I can see why it would be great for soldiers and others with PTSD--it is very non threatening, calming and guides the listener back towards their center--often a scary place for people who have experienced a trauma. Dr Siani has a pleasant manner and voice. A positive experience--glad I gave it a try. Recommended. Just what a guided meditation should be... and what many audio meditations for purchase are not. 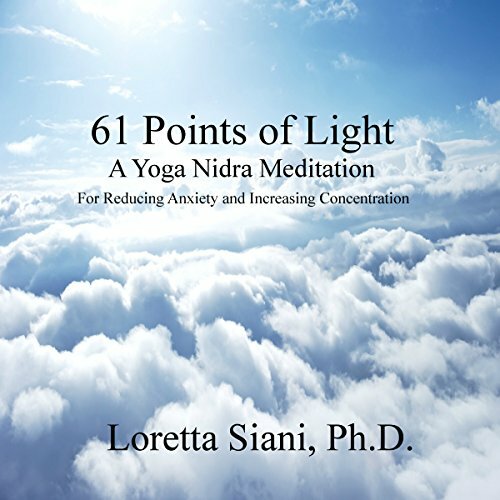 I have a nice library of guided meditations, quick breaks to longer, deeper, focused sessions, and Loretta Siani's 61 Points of Light is one I'll return to frequently among them all. 1) Siani has a great voice for audio—and for guiding meditation. Her voice and tone are soothing, relaxing, and inviting—friendly. 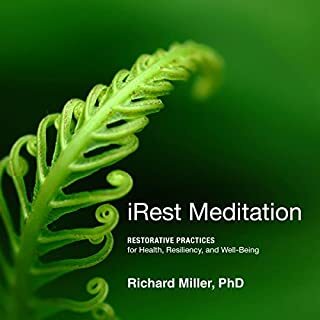 (How many free or sold guided meditations have you bought or sampled, only to find the guide's actual voice NOT at all conducive to comfortable listening or a soothing subject matter!) I thought it was also a great touch when Siani's voice would lower or slow or even fade a bit (not a technical glitch - masterful vocal adjustment for a distinct moment) and suit the words, instructions, etc. perfectly. Many narrators of guided meditation can seem to be more focused on the consistency of their voice and pace of speaking then on the quality of the meditative guidance they are giving and altering their voice for the subject. And, in focused meditation, every moment, every adjustment counts and alters the experience. 2) Siani's personality/manner make you feel "safe." Important, when you are venturing to let another person into your head and guide your subconscious! As I began this meditation, I consciously felt safe with truly letting go and experiencing the next 25 minutes with Siani... and that allowed me to fully experience the meditation as intended. 3) Siani's introduction, before beginning the meditation, was adequately brief and an added benefit. 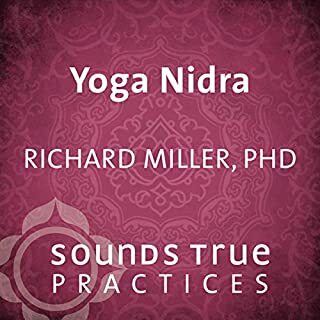 I liked hearing and being reminded of the benefits to be gained from yoga nidra and the 61 Points of Light meditation; it helped me focus on those and "feel" the benefits to a greater extent. 4) The 61 Points of Light meditation itself is DEEPLY relaxing. I honestly have not felt this level of relaxation from any other guided meditation before. 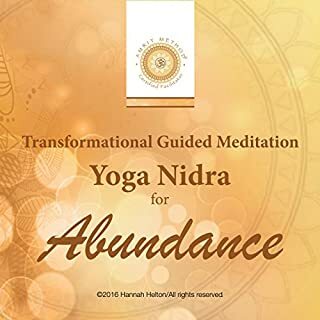 Considering the experience, the connection and comfort with Loretta Siani's narration skills, and the level of relaxation that stands out from other meditation experiences, I'll be perusing her catalog of audio for many more new purchases. This guided meditation is so easy and peaceful, I think it is the very best I've heard. It is great for anyone overtired or with body pain. What a lovely caring voice. Just what I needed to start my day in a calm loving manner. I will listen to it daily. The narrator's voice is excellent! I do 61 points everyday to my students, it is awesome that I now have someone to help me through it. I use it to help me sleep and relax. Very healing and of the highest quality. Siani demonstrates great maturity and insight. Very refreshing. Loved her voice, deep meditation and relaxation. It really increases the power of concentration. Om. Love it! Always enjoy doing Nidra mediation. It really works for me, calming me down and relaxing. I found the instrumental and the not so subtle heartbeat rhythm, to be so distracting that i was unable to relax, which defeated the point of the book. I find this to be a very effective meditation. it is read beautifully by the author. It's the state I feel just as I wake up . you encounter this state just after a good sleep, no alarms just your body clock. at this point you feel calm child like no stress, worry. This is how I feel after I have listened to the book. I recommend this delightful yoga nidra. A beautifully narrated meditation which I am using a lot. I like the imagery of the little blue star. this is the second of Loretta`s audios i have purchased., the other is "the lake". i recommend both. This is very calming and the simple visualization of a flame or star of light at various points of the body works well for me. This does not have any overt religious content. I found myself naturally becoming more still and relaxed and easily breathed slowly and deeply wihout trying. 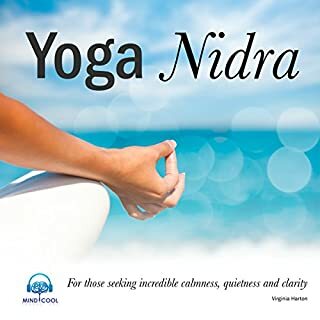 I'd come across two Yoga Nidra recordings before, both of which seem quite good. They induced such a deep state of relaxation that I always fell into a sleep like state. This recording however has a different effect. Your relaxation is apparent but you remain conscious and your mind goes quiet. I felt energised yet serene at the end. It's not too long and not too short. The narrator's voice is soothing and calming, taking you through the 61 points of light. Perfect to start your day or when you are particularly stressed.